‘Draft shmaft’. The term New York Ranger prospect pool is a bit of an oxymoron. While most NHL teams believe the key to building a successful franchise is through the draft, the New York Rangers clearly don’t share that philosophy. The Rangers have not selected in the first round since 2012 and this summer they didn’t make a pick in the top-80. When you’re not selecting in the top end of the draft, it’s very hard to have any semblance of a valuable prospect pool. The cupboards are not completely bare but there certainly aren’t a lot of prospects to write home about. Nicklas Jensen is a guy that has the talent if he can figure out how to play at the pro level, Ryan Gropp looks like a player that could be a good second liner, and I’m one of the few left in the camp that thinks Sean Day will eventually figure it all out. It’s a good thing that the team has young players like Miller, Lindberg, Hayes, Fast, Kreider and the newly acquired Mika Zibanejab – because high-end reinforcements aren’t coming from the farm anytime soon. That said, let’s take a look at the complete Rangers prospect depth chart. The Rangers really have nothing down the middle – and that’s never a good thing when talking about a prospect pool. Tambellini might end up being a bottom-6 guy in the NHL, but the rest are a long shot to ever make any sort of impact with the Rangers. As mentioned above, Gropp and Jensen both have a lot of talent. Both can provide offense and might end up as complementary scoring options at the NHL level but neither has the type of high-potential ceiling you’d like to see from your top prospects. Ty Ronning- this year’s 7th round pick has some offensive talent but he’s tiny and can’t skate at a level to make up for his lack of size. The last first round pick that that Rangers held on to was the 28th overall pick in 2012 and they used it on Brady Skjei – and while it looks like he will end up being an NHL regular, he’s far from the top-pairing guy you would like to see from a first round pick. Skejei and McIlrath look like they will be competent NHLers but if you have them playing in your top-4, you’re in trouble. Neither has lived up to their draft status and neither instills confidence when you see them sitting at the top of your prospect depth chart. The one true x-factor in the organization is Sean Day. After joining John Tavares, Aaron Ekblad and Connor McDavid as the only players to ever be granted exceptional status in the OHL, Day has failed to live up to the lofty expectations. He’s a big body and an incredibly skilled skater that has all the tools necessary to be a top pairing defender in the NHL. The issue is between his ears. Day has shown a lack of awareness both on and off the ice in terms of hockey sense as well as the ability to show the desire to be a professional hockey player. After watching him closely for two years in Mississauga, I truly believe that the potential is still there for Day to figure it all out and turn into the steal of the 2016 draft. The problem is that it will take some significant maturation from Day and many scouts are starting to think it simply won’t come. Many have been touting Brandon Halverson as the goalie of the future in New York but Adam Huska is a guy to keep an eye on as he begins his NCAA career next year. Halverson is an extremely talented young goalie who took a bit of a step back this season after being a lot better for the Soo Greyhounds a year earlier. 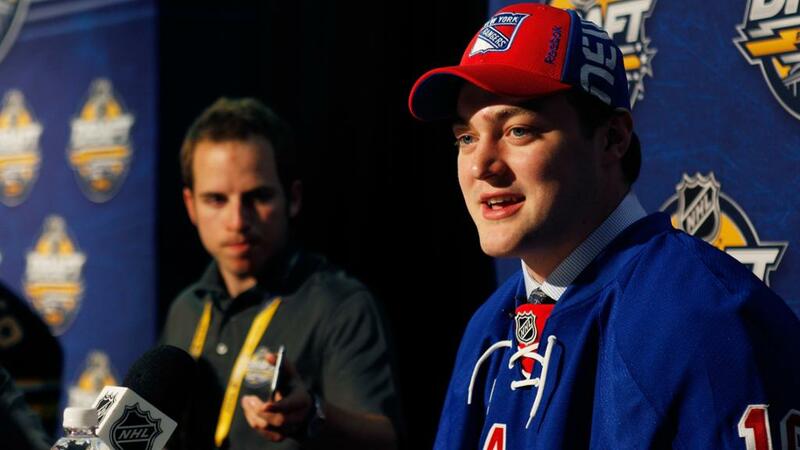 He will look to establish himself as in Hartford this season as he continues his developemtn towards the NHL. Tyler Wall is an intriguing prospect from this year’s draft that will look to establish himself as a true prospect this year as a freshman at UMass-Lowell. Shesterkin is a guy that many fans seem to be very high on, the issue is that he has never and may never play a professional hockey game in North America. Until he does it is very foolish to count on him as a key to th future. With only 7 KHL games under his belt it will be a while before we know what the future holds for a guy that at this point shouldn’t be looked at as anything more than a long shot to play in the NHL. A guy like Skapski are likely nothing more than organization depth to fill out AHL and ECHL lineups down the road.